U.S. Flag Store's Connecticut State Flag is printed in America on Nylon flag fabric. Since this flag is made in America, U.S. Flag Store is able to ensure that the complex State emblems are printed with accuracy, sharp detail and bright colors. This outdoor Connecticut State Flag is finished with the same high quality materials as all of U.S. Flag Store's US flags, and is extremely durable and long lasting. Design: The flag is made up of a blue field with a badge in the center that contains three grapevines. Below the badge is the state's motto "Qui Transtulit Sustinet", which translates to "He who transplanted us still sustains us." Meaning: The three grapevines inside the shield supposedly represent the three original settlements that made up the colony of Connecticut: Hartford, Wethersfield, and Windsor. It is also said that they represent religion, liberty, and knowledge. Although Connecticut was the 5th colony to sign the Constitution of the United States of America in 1788, over 100 years later the state still did not have an official flag of its own. This fact alarmed Mrs. Abby Day Slocomb, a Connecticut citizen and founder of the Anna Warner Bailey Chapter of the Daughter of the American Revolution (DAR). Abby Day Slocomb was a rich woman originally from New Orleans, Louisiana and was extremely used to getting her way. 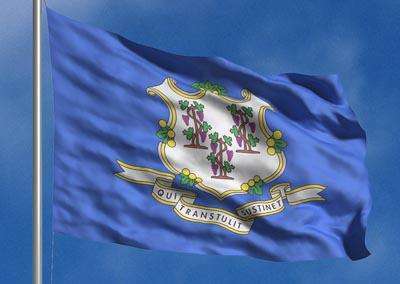 So, when she set her sights on getting Connecticut an official state flag nothing could stop her from reaching her goal. Abby Slocomb and her chapter of the DAR created numerous flag designs and presented them to the Connecticut state legislature for consideration. The women worked very hard for their goal, lobbying legislative members individually until their efforts finally paid off. In 1895, the Governor brought a flag based on a DAR design to the Connecticut General Assembly to be considered. In 1897 this flag was adopted and made the first official flag of the state of Connecticut. The design was a blue flag with a shield of gold and silver embroidery. Inside the shield were three joined grapevines and underneath of it was a banner with the state's motto "Qui Transtulit Sustinet". A print of Slocomb's original flag design is currently on display at the Monument House Museum at Fort Griswold Battlefield State Park.